I (Dawn Burke) am a Trained Interior Designer by trade and I´ve always naturally favored commercial interior design over residential, although I enjoy doing both. If you come to visit me at our current offices in Naples, you will be able to see the result of my own work in the building. 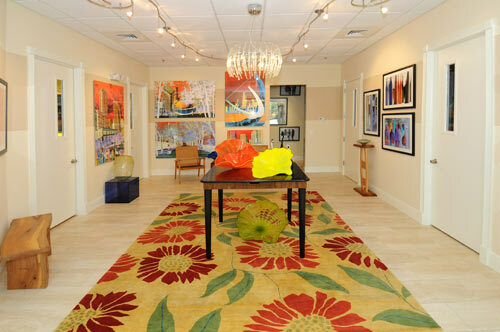 It used to be the Old Naples Veterinarian Clinic, and it now houses three interior designer offices and our business. I had my own Interior Design business in Manhattan, but I always wanted to get into construction because I like structural design. I met my husband and business partner, Bill Burke, in New Jersey, where he was a licensed plumber. He was doing a lot of new construction, and we blended our businesses, to the point where we´ve been working together for 15 years. We both love what we do and that´s why we can offer you the best of both worlds - construction and remodeling and plumbing. When you hire us to do your commercial construction and remodeling, you are in fact hiring two project managers who are also the owners and managers of the business. This means we are involved from beginning to end and we care about you and we want you to be 100% satisfied with our work. We know that our commercial and residential clients are entrusting us with the most important asset they own. We honor that trust and we make sure that our clients feel that. So, whether you want to remodel your office bathroom or the whole interior, we can do that for you, and we will do it as we do every job we take on: with care, respect and attention to detail. Come in and see the before and after photos of our construction work, to include our own office, talk to our satisfied clients and let us take care of you and your commercial construction needs.